Lutz, Wolfgang. 2007 (16. ed. first published in 1967) Leben ohne Brot. INFORMED. This is the only German book I have started reading. I was quite shocked to find that Dr. Lutz (an Austrian) took a critical stance toward grain carbs and warned against overconsumption of grain products and the demonizing of fat (not meaning industrially processed fat like margarine, transfats, vegetable oil etc., but fat as it occurs naturally in foods) already in 1967. 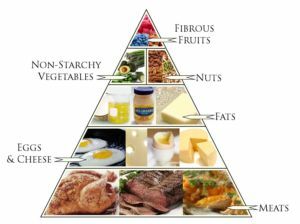 Very interesting is also the so-called ketogenic diet. (See the following article – one among many.) Here the idea is to starve cancer cells by eliminating all sugar from one’s diet, as cancer cells assumedly strive on glucose. In tests on animals, cancerous cells have indeed been found to recede; according to some articles in the English speaking realm, there have also been cases where patients’ cancers receded after following a strict ketogenic diet. Concerning my own eating habits: I have changed a lot, and observed the effects. I used to think that I ate fairly healthily: I cooked regularly, also vegetables, and all in all believed to have a rather balanced diet. I also tried not to eat too much meat. Not because I don’t like meat, but for ethical reasons. So whenever I did buy meat, I tried to buy organic, basically that meant organic ground beef. My vegetable choices were mostly frozen, and I did make myself a pasta dish every once in a while – actually quite often as I began to realize when I started to change things. I also liked cake and chocolate and ice cream, and even though I ate all of it in moderation, I did consume some from the list on a more or less daily basis. In the beginning, I wanted to follow the Paleo Diet – though without the dairy restriction. I love cheese and there was no way I would go along with some long gone stone-agers. Who knew, the only reason they didn’t eat cheese was because they had no idea how to make it. I’m sure, my paleolithic ancestors would have loved cheese. In general, it is not totally sure, and never will be, I guess, what paleolithic humans really ate. The assumptions behind the Paleo diet should not be taken too dogmatically. It was still a very interesting experience to go along with. I lost some weight (which was not my aim, I had a normal BMI of 22), the little ‘sugar-belly’ went away, and in the beginning I was often hungry. You have to plan your daily eating differently. Where I work are mainly food deserts: most vending machines in companies are full of exactly those things you’re not supposed to eat. In the mean time, I leave a little space for occasional ‘sins’, and have gotten used to most of the changes. I cook differently: I bought a slow cooker and experiment with various meat dishes, especially with Galloway Goulash meat that I sometimes transform into something like an Indian curry. In the mean time, I have read less radical books than those propagating Paleo. However, all authors share at least three basic principles: no sugar, no processed food and no grains, and eat as much natural food as possible with a strong emphasis on vegetables, meat, fish, ‘good’ fat (coconut oil, olive oil, nuts and avocados – all the stuff we have been told for decades make us fat.) It seems the only thing that makes people fat is sugar in form of the refined sweet stuff and in form of empty (‘bad’) carbohydrates (esp. wheat). Fruit is included in all recommendations; however, all agree to consume very sweet fruits in moderation. On dairy products, especially milk, there is less agreement. In the Perfect Health Diet the authors explain what the problem with milk is, according to their research. The main argument of the Paleo proponents is to go back in history and base our diets on what our ancestors ate, and what our bodies have been adapted to over the course of our evolutionary history. Milk and dairy, according to them, is not part of it. The Jaminet’s don’t agree and argue that humans drank milk from animals fairly early (citation needed), and that it showed in patients (they are physicians) if they had consumed milk (e.g. as children) or not. The problem was not with the milk, they say, the problem lay in the pasteurization process. The milk we get today is not raw milk, it has always been treated and thus lost many of its qualities as natural food.